1001 Nights was one of Alton Towers' first attractions to join the Corkscrew in Festival Park in the early eighties. In 1994 however, due to its age, and probably the fact that it stuck out about twenty or thirty feet above the trees, it was removed, and replaced by Energizer. The ride was simple in what it did, being a large platform seating about 48 riders, attached to a long rotating arm. 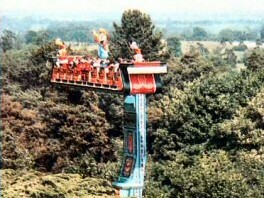 The arm would rotate vertically, but the platform remained horizontal, taking the riders 85 feet into the air, above the tree tops. The ride would create a fantastic weightlessness feeling as it dropped and rose in large sweeping circles.